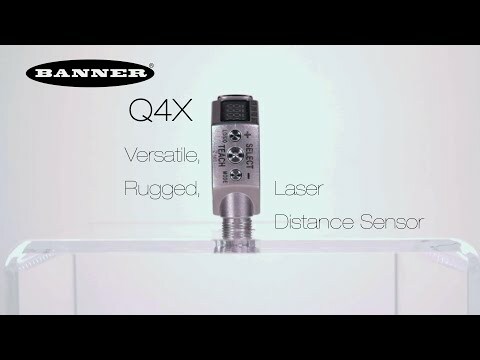 Minneapolis, MN—September 29, 2015—Banner Engineering’s industry-recognized Q4X laser distance sensor is now available in models exclusively designed for clear object detection. Featuring a default clear object detection mode setting, the Q4X clear object model eliminates two-point, dynamic, foreground and background suppression mode. Without requiring a retro-reflector, the Q4X sensor combines window thresholds on both target distance and target reflected intensity, allowing the Q4X to reliably solve clear object detection applications such as thermal formers, blow molding, bottle filling, bottle handling, shrink-wrap packaging, and bottle, jar or tray detection. Offering a simplified user experience, the Q4X includes a bright readout on a highly visible, angled four-digit display that is easily viewed from multiple vantage points. The Q4X also offers intuitive user setup utilizing three tactile push-buttons conveniently located below the display. The Q4X is constructed with robust housing rated to IP67, IP68 or IP69K, allowing use in wet and high-pressure washdown environments, durable FDA-grade stainless steel resists mechanical impact, over tightening, extreme vibration and aggressive cleaning procedures. With best in class excess gain, bipolar PNP and NPN outputs, a reliable 25 to 300 mm detection range and superior ambient light immunity, the Q4X can solve even the most challenging distance-based, part-detection applications.